Green grass, white lines, goals and competition. This is the scene planned for the vacant lot north of USU Eastern. What is now an open field with sparse patches of grass has a destiny of becoming a soccer mecca in Carbon County. 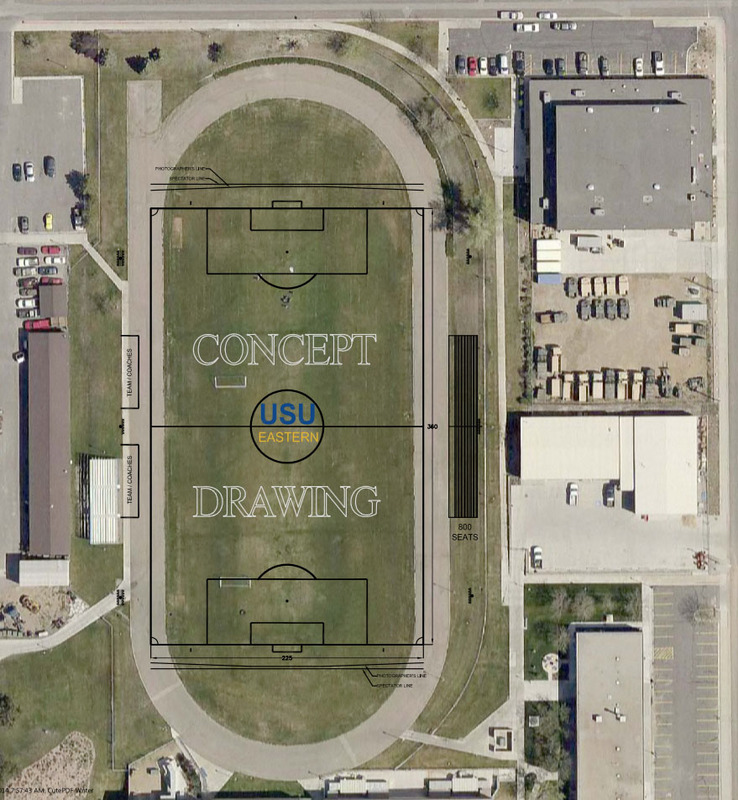 Utah State University Eastern, in collaboration with Carbon County officials, are making efforts to turn that patch of unused land into competitive soccer fields, for not only college students but also local country recreational personnel. USUE and the county working together is a win-win situation. The county has been considering putting in soccer fields for youth soccer programs and other athletic soccer programs plus USUE needs a larger soccer field for collegiate play. Eric Mantz, associate vice chancellor – Price campus business services, described a scenario where both parties would benefit the university, the county and even the local high schools if agreements are met by all parties. A draft document has been given to the county for review and a request has been made for the county to make a final document. The land is owned by USU Eastern and it is anticipated it will be leased to the county for 20 years. USU Trustees and the Utah System of Higher Education Regents have agreed to this proposed use of land as long as it meets the attorney general’s approval. Though nothing has been formally agreed upon and no lease has been signed, Carbon County commissioners will meet the first part of December to further the discussions on the project. USUE hopes to build upon its nationally ranked soccer program and provide spaces for clubs as well as bring in soccer camps to give the college greater exposure. This isn’t a strictly university-benefiting endeavor, Mantz said. The main point of this is to make use of the land, provide the county with new soccer fields and in the process have new fields for the soccer team plus bring in revenue for the school and city. Two new fields will be placed on the lot located at 600 north between 500 and 600 east. A parking lot plus bleachers and facilities will make it a competitive site worthy of the players, both collegiate and youth, Mantz said. These new fields will breathe new life into the local sports scene, pending approval from the county and its residents. USUE wants to have a 10-year option in the lease that reads if the university needs to use that land for a new facility, it can, but that is over a decade away. For the time being, if the plans gets approved, Eastern will receive funds from the city for the lease of the field. The school will have first use of the field, but will share with the county and depending on the amount of traffic the field sees, the local high school may be included in the lease. The benefits to the building of these fields are both positive for the county and the university. Colligate players and youth players will have three new fields to play on and USUE soccer players can compete on regulation “soccer” fields.